Single row angular contact ball bearings accommodate axial loads acting in one direction only. Under radial loads a force acting in the axial direction is produced which must be counteracted. Consequently the bearings are normally adjusted against a second bearing. The single row angular contact ball bearings have one high & one low shoulder on each ring enabling a large number of balls to be incorporated. 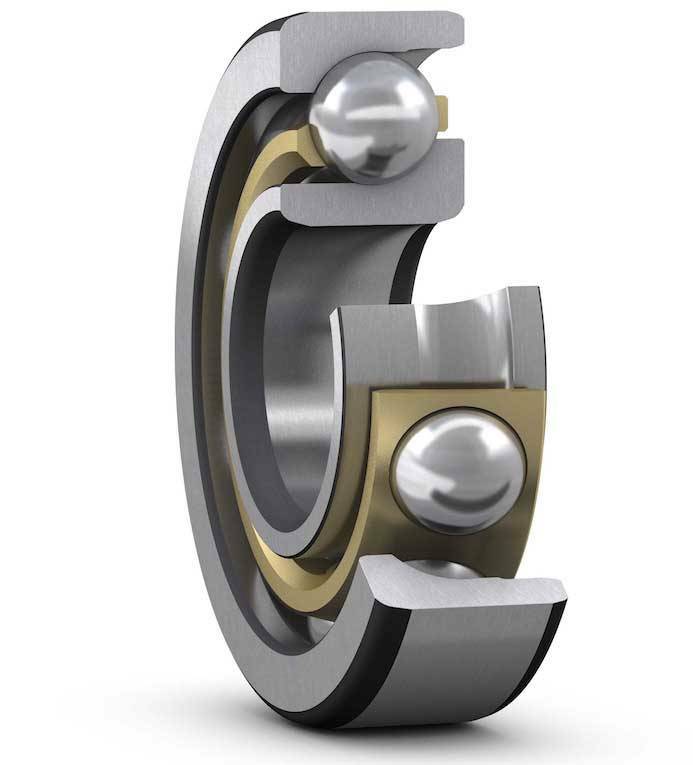 This gives the bearings relatively high load carrying capacity, the most popular contact angle is 40 (suffix B in the designation) this gives the bearings heavy axial loads. Single row angular contact ball bearings for universal matching are specially manufactured for applications, where two individual bearings are mounted side by side in random order e.g. in back to back arrangement. The rings are machined to ensure that specific clearances or preload values are attained within a mounting arrangement. Individual bearings can be arranged in either Back to Back, Face to Face or Tandem mounting arrangement & demonstrate excellent ability to absorb radial & axial loads. Double row angular contact ball bearings resemble two single row angular contact ball bearings arranged Back to Back, but they are narrower than two single row bearings. They can accommodate heavy radial loads & axial loads acting in either direction. The most common contact angle is 32º & provide relatively stiff bearing arrangements which can also take up tilting moments. Bearings fitted with pressed steel & brass cages have ball filling slots on one side face, because they have filling slots an appreciably greater number of balls can be incorporated. This imparts the high radial & axial load carrying capacity. Double row angular contact ball bearings are also available as standard in shielded & sealed versions.